*One (1) Preferred Parking Pass for every two (2) 2-Day Packages purchased. Click here to learn more about the Championship’s only, all-inclusive premium ticket package. 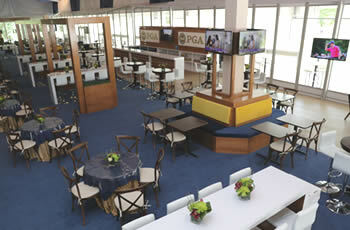 Image provided as a visual reference of PGA Hospitality and does not represent the Hole 18 viewing suite's final interior. Includes admisson to the Empire Club and grounds of Bethpage Black Saturday, May 18, and Sunday, May 19. Juniors 17 and under must have their own purchased Empire Club ticket to enter this venue. There will be no daily re-admission to the grounds of Bethpage State Park. If you leave the grounds, you must have an unscanned ticket to return to the Championship. Once the bottom of the ticket has been scanned, it will no longer provide admission. The only exception is when the Weather Warning signs have been posted. Re-admission to the Empire Club facility on-course at Bethpage Black will require both a wristband, issued by Hospitality Services upon arrival at the Club, and the original, daily Empire Club ticket. 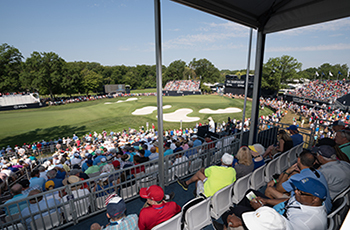 For questions or for larger group hospitality packages, please contact Rick Jenkins, 2019 PGA Championship Hospitality Sales Manager, at 201-247-5860 or RJenkins@pgahq.com.